Description:The Authorized Ender Companion is a complete and in-depth encyclopedia of all the persons, places, things and events in Orson Scott Card’s Ender Universe. 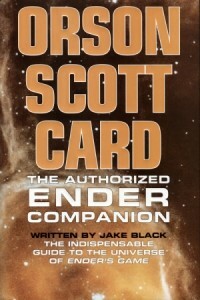 Written by Jake Black under the editorial supervision of Card himself, The Authorized Ender Companion will be an invaluable resource for readers of the series. If you ever wondered where Ender went after he left Earth, before he arrived at Lusitania, you’ll find the answer here. If you ever wondered how the battle room worked, you’ll find the answer here. If you forgot the names of the people were who discovered the descolada, the answer is here. The history of Gloriously Bright’s world? Here. Interesting Tidbits: Our partner PhiloticWeb.Net made a significant contribution to the encyclopdia and are included in the Acknowledgments.